Cage Warriors Fighting Championship is set to round off its schedule for the first half of 2014 with an unprecedented event in London on Saturday, June 7. Following a hectic recent spell which has seen Europe’s leading MMA promotion host seven shows in the space of just eleven weeks, visiting five different countries in the process, CWFC will sign off in style for a summer break with Cage Warriors 69: Super Saturday. The event, which will take place at The Forum in Kentish Town, London, will be CWFC’s eighth so far this year and is set to feature not one – but two! – main cards, which will follow both unaired and Facebook prelims. 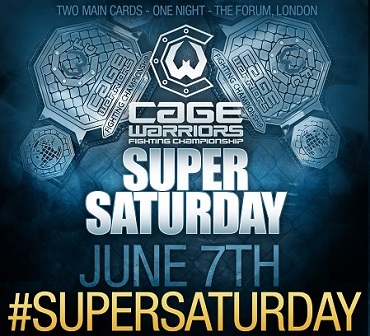 With each main card to be headlined by a CWFC world title bout, Super Saturday will bring fans an extravaganza of top-class MMA, with professional action beginning at 3pm and continuing right through until approximately 11pm. Super Saturday will kick off with an unaired preliminary card, followed by Facebook prelims – which will be streamed live and free of charge around the world – at 4pm BST. The first of Super Saturday’s televised main cards will get underway at 6pm BST, before the second – which culminates in the meeting of Stevie Ray and Curt Warburton for the vacant CWFC lightweight world title – swings into action at 9pm BST. “After our event in London on June 7, we’ll be taking a break until CWFC 70 in Dublin on August 16 while the World Cup takes centre stage, so we want to treat the fans to something big before we do that,” said Cage Warriors Fighting Championship CEO Graham Boylan. “Almost every other sport has a marquee event on its calendar, whether that be the Superbowl or the Champions League final, so this is something MMA needs and it’s something we’ll be looking to make an annual event. As previously announced, Stevie Ray (14-5) will look to regain the CWFC lightweight world title when he takes on Curt Warburton (13-4) for the vacant strap in the final bout of the night, which will headline part two of Super Saturday. The full card and line-up for Super Saturday will be confirmed in the coming weeks, but also on the bill will be a massive middleweight bout between Jack Marshman (14-5) and Bola Omoyele (7-2). CWFC’s stacked welterweight division will be in focus on the night, with Simeon Thoresen (17-4-1) set to make his Cage Warriors debut against Jake Bostwick (14-8-0-1). Meanwhile, Benny Alloway (13-5) will collide with Mohsen Bahari (7-1) and Jack Mason (27-13) is scheduled to face Bruno Carvalho (15-8). See below for details of all eight bouts announced so far, and get your tickets – priced from just £25 – for Super Saturday when they go on sale online from The Forum at 9am BST this Friday, May 9. I’m in the middle of writing another article about Cage Warriors at the moment so I won’t go on here, but suffice to say this all sounds very awesome and I love the idea of a showpiece mid-summer event for the promotion and also the sheer practicality of acknowledging that they don’t want to overload their fan base during the World Cup. This entry was posted in Articles and tagged Cage Warriors. Bookmark the permalink.